And still these blogs do not exhaust the scope of either the idea of space itself or the research in progress to get to the bottom of our experience of it. This essay, based on a talk I gave at the Belmont Astronomical Society on October 5, 2017 will try to cover some of these other ideas and approaches that are loosely believed to be a part of a future theory of quantum gravity. It is the basic idea that the two great theories of physics, Quantum Mechanics and General Relativity are incompatible with each other and do not actually deal with the same ingredients to the world: space(time) and matter. Quantum gravity is a hypothetical theory that unifies these two great ideas into a single language, revealing answers to some of the deepest questions we know how to ask about the physical world. It truly is the Holy Grail of physics. Why do we need quantum gravity at all? Quantum mechanics is a theory that describes matter and fields embedded in a pre-existing spacetime that has no physical effect on these fields other than to provide coordinates for describing where they are in time and space. It is said to be a background-dependent theory. General relativity is only a theory of space(time) and does not describe matter’s essence at all. It describes how matter affects the geometry of spacetime and how spacetime affects the motion of matter, but does so in purely ‘classical’ terms. Most importantly, general relativity says there is no pre-existing spacetime at all. It is called a background-independent theory. Quantum gravity is an overarching background-independent theory that accounts for the quantum nature of matter and also the quantum nature of spacetime at scales where these effects are important, called the Planck scale where the smallest unit of space is 10^-33 cm and the smallest unit of time is 10^-43 seconds. We need quantum gravity because calculations in quantum mechanics are plagued by ‘infinities’ that come about because QM assumes space(time) is infinitely divisible into smaller units of length. When physical processes and field intensities are summed over smaller and smaller lengths to build up a prediction, the infinitesimally small units lead to infinitely large contributions which ‘blow up’ the calculations unless some mathematical method called ‘renormalization’ is used. But the gravitational field escribed by general relativity cannot be renormalized to eliminate its infinities. Only by placing a lower limit ‘cutoff’ to space(time) as quantum gravity does is this problem eliminated and all calculations become finite. We need quantum gravity because black holes do not possess infinite entropy. The surface area of a black hole, called its event horizon, is related to its entropy, which is a measure of the amount of information that is contained inside the horizon. A single bit of information is encoded on the horizon as an area 2-Planck lengths squared. According to the holographic principle, the surface of a black hole, its 2-d surface area, encodes all the information found in the encompassed 3-d volume, so that means that the spacetime interior of a black hole has to be quantized and cannot be infinitely divisible otherwise the holographic principle would be invalid and the horizon of the black hole would have to encode an infinite amount of information and have an infinite entropy. We also need quantum gravity because it is believed that any fundamental theory of our physical world has to be background-independent as general relativity shows that spacetime is. That means that quantum mechanics is currently an incomplete theory because it still requires the scaffolding of a pre-existing spacetime and does not ‘create’ this scaffolding from within itself the way that general relativity does. Historically, Newton gave us space and time as eternally absolute and fixed prerequisites to our world that were defined once and for all before we even started to describe forces and motion. The second great school of thought at that time was developed by Gottfrid Leibnitz. He said that time and space have no meaning in themselves but only as properties defined by the relationships between bodies. Einstein’s relativity and its experimental vindication has proven that Newton’s Absolute Space and Time are completely false, and replaced them by Leibnitz’s relativity principle. Einstein even said on numerous occasions that space is an imaginary construct that we take for granted in an almost mythical way. Space has no independent existence apart from its emergence out of the relationships between physical bodies. This relationship is so intimate that in general relativity, material bodies define the spacetime geometry itself as a dynamical solution to his famous relativistic equation for gravity. How does the experience of space emerge? In general relativity, the only thing that matters are the events along a particle’s worldline, also called its history. These events encode the relationships between bodies, and are created by the intersections of other worldlines from other particles. This network of fundamental worldlines contains all the information you need to describe the global geometry of this network of events and worldlines. It is only the geometry of these worldlines that matters to physical phenomena in the universe. The wireframe head in this illustration is an analog to worldliness linking together to create a geometry. The black ‘void’ contains no geometric or dimensional information and any points in it do not interact with any worldline that makes up the network. That is why ‘space’ is a myth and the only thing that determine the structure of our 4-d spacetime are the worldliness. General relativity describes how the geometry of these worldlines creates a 4-dimensional spacetime. These worldlines represent matter particles and general relativity describes how these matter particles create the curvature in the worldlines among the entire system of particles, and thereby creates space and time. The ‘empty’ mathematical points between the worldlines have no physical meaning because they are not connected to events among any of the physical worldlines, which is why Einstein said that the background space in which the worldlines seem to be embedded does not actually exist! When we look out into ‘space’ we are looking along the worldlines of light rays. We are not looking through a pre-existing space. This means we are not seeing ‘things in space’ we are seeing processes in time along a particle’s history! There are two major quantum gravity theories being worked on today. String theory says that particles are 1-dimensional loops of ‘something’ that are defined in a 10-dimensional spacetime of which 4 dimensions are the Big Ones we see around us. The others are compact and through their geometric symmetries define the properties of the particles themselves. It is an approach to quantum gravity that has several problems. This figure is an imaginative rendering of a ‘string’. First it assumes that spacetime already exists for the strings to move within. It is a background-dependent theory in the same spirit as Newton’s Absolute Space and Time. Secondly, string theory is only a theory of matter and its quantum properties at the Planck scales, but in fact the scale of a string depends on a single parameter called the string tension. If the tension is small, then these string ‘loops’ are thousands of times bigger than the Planck scale, and there is no constraint on what the actual value of the tension should be. It is an adjustable parameter. Loop Quantum Gravity is purely a theory of spacetime and does not treat the matter covered by quantum mechanics. It is a background-independent theory that is able to exactly calculate the answers to many problems in gravitation theory, unlike string theory which has to sneak up on the answers by summing an infinite number of alternate possibilities. LQG arrives at the answer ‘2.0’ in one step as an exact answer while for example string theory has to sum the sequence 1+1/2+1/4+1/8+1/16 +…. To get to 2.000. LQG works with elementary spacetime ingredients called nodes and edges to create spin networks and spin foam. Like a magnetic field line that carries magnetic flux, these edges act like the field lines to space and carry quantized areas 1 Planck length squared. By summing over the number of nodes in a spin network region, each node carries a quantum unit of space volume. These nodes are related to each other in a network of intersecting lines called a spin network, which for very large networks begins to look like a snapshot of space seen at a specific instant. The change of one network into another is called a spin foam and it is the antecedent to 4-d spacetime. There is no physical meaning to the nodes and edges themselves just as there is no physical meaning to the 1-d loops than make up strings in string theory. . They are pure mathematical constructs. So far, the best idea is that LQG forms the bedrock for string theory. String theory looks at spacetime and matter far above the Planck scale, and this is where the properties of matter particles make their appearance. LQG creates the background of spacetime that strings move through. However there is a major problem. LQG predicts that the cosmological constant must be negative and small, which is what is astronomically observed, while string theory says that the cosmological constant is large and positive. Also, although LQG can reconstruct the large 4-d spacetime that we live in, it does not seem to have have any room for the additional 6 dimensions required by string theory to create the properties of the particles we observe. One possibility is that these extra dimensions are not space-like at all but merely ‘bookkeeping’ tools that physicists have to use which will eventually be replaced in the future by a fully 4-d theory of strings. Another approach still in its infancy is Causal Set Theory. Like LQG it is a background-independent theory of spacetime. It starts with a collection of points that are linked together by only one guiding principle, that pairs of points are ordered by cause-and-effect. This defines how these points are ordered in time, but this is the only organizing principle for points in the set. What investigators have found is that such sets create from within themselves the physical concepts of distance and time and lead to relativistic spacetimes. 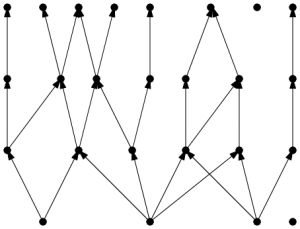 Causal Sets and the nodes in LQG spin networks may be related to each other. Another exciting discovery that relates to how the elements of quantum spacetime create spacetime involves the Holographic Principle connected with quantum entanglement. The Holographic Principle states that all the information and relationships found in a 3-d volume are ‘encoded’ on a 2-d surface screen that surrounds this volume. This means that relationships among the surface elements are reflected in the behavior of the interior physics. 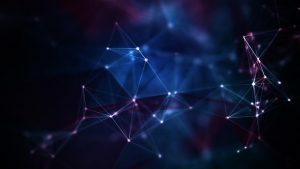 Recently it was discovered that if you use quantum entanglement to connect two points on the surface, the corresponding points in the interior become linked together as a physical unit. If you turn off the entanglement on the surface the interior points become unconnected and the interior space dissolves into unrelated points. The amount of entanglement can be directly related to how physically close the points are, and so this is how a unified geometry for spacetime inside the 3-d ‘bulk’ can arise from unconnected points linked together by quantum entanglement. Sometime between 15 and 20 billion years ago the universe came into existence. Since the dawn of human awareness, we have grappled with the hows and whys of this event and out of this effort have sprung many ideas. An ancient Egyptian legend describes how the universe was created by Osiris Khepera out of a dark, boundless ocean called Nu and that Osiris Khepera created himself out of this ocean by uttering his own name. Human inventiveness has not stood still in the 5000 years since these ideas were popular. The modern theory of the Big Bang states that our universe evolved from an earlier phase billions of times hotter than the core of our sun and trillions of times denser than the nucleus of an atom. 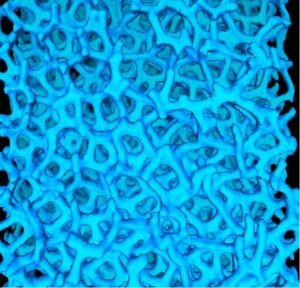 To describe in detail such extreme physical conditions, we must first have a firm understanding of the nature of matter and of the fundamental forces. At the high temperatures likely to have attended the Big Bang, all familiar forms of matter were reduced to their fundamental constituents. The forces of gravity and electromagnetism together with the strong and weak nuclear forces, were the essential means through which the fundamental particles of matter interacted. The feedback between cosmology and particle physics is nowhere more clearly seen than in the study of the early history of the universe. In October, 1985 the giant accelerator at Fermilab acheived for the first time, the collision of protons and anti-protons at energies of 1.6 trillion electron volts, about 1600 times the rest mass of the proton. This was a unique event because for one split second, on a tiny planet in an undistinguished galaxy, a small window onto the Creation Event was opened for the first time in at least 15 billion years. The persuit by physicists of a single, all encompassing theory capable of describing the four natural forces has, as a by-product, resulted in some surprising glimpses of the Creation Event. Although such a theory remains perhaps several decades from completion, it is generally recognized that such a theory will describe physical conditions so extreme it is quite possible that we may never be able to explore them first- hand, even with the particle accelerators that are being designed today. For example, the Superconducting Supercollider to be built by the early 1990’s will cost 6 billion dollars and it will allow physicists to collide particles at energies of 40 trillion electron volts ( 40,000 GeV) matching the conditions prevailing 10 seconds after the Big Bang. The expected windfall from such an accelerator is enormous and will help to answer many nagging questions now plaguing the theoretical community, but can we afford to invest perhaps vastly larger sums of money to build machines capable of probing the quantum gravity world at 10 GeV? At these energies, the full unification of the natural forces is expected to become directly observable. How curious it is that definite answers to questions such as, ‘What was Creation like?’ and ‘Do electrons and quarks have internal structure?’ are so inextricably intertwined. Our ability to find answers to these two questions, among others, does not seem to be hampered by some metaphysical prohibition, but by the resources our civilization can afford to devote to finding the answers. Fortunatly, the situation is not quite so bleak, for you see, the ‘machine’ has already been ‘built’ and every possible experiment we can ever imagine has already been performed! 1) We are here, therefore, some regions of the universe are hospitible to the creation of complex molecules and living, rational organisms. 2) Our Universe has 4 big dimensions and all are increasing in size as the universe expands in time and space. 3) There are 4 dissimilar forces acting in Nature. 4) Only matter dominates; no anti-matter galaxies exist and this matter is built out of 6 quarks and 6 types of leptons. The task confronting the physicist and the astronomer is to create, hopefully, a single theory consistent with these metafacts that can then be used to derive the secondary characteristics of our universe such as the 2.7 K background radiation, the primordial element abundances, and galaxy formation. The interplay between the study of the macrocosm and the microcosm has now become so intense that astronomers have helped physicists set limits to the number of lepton families — No more than 4 are allowed otherwise the predicted cosmological abundance of helium would seriously disagree with what is observed. Physicists, on the other hand, use the astronomical upper limits to the current value of the cosmological constant to constrain their unification theories. 1) There were not enough basic fields predicted to accomodate the known particles. 2) Left and right-hand symmetry was mandated so that the weak force, which breaks this symmetry, had to be put in ‘by hand’. 3) Anomalies exist which include the violation of energy conservation and charge. 4) The Cosmological Constant is 10 times larger than present upper limits suggest. In recent years, considerable effort has gone into extending and modifying the postulates of SUSY GUTs in order to avoid these problems. One avenue has been to question the legitimacy of a very basic premise of the field theories developed heretofore. The most active line of theoretical research in the last 25 years has involved the study of what are called ‘point symmetry groups’. For example, a hexagon rotated by 60 degrees about a point at its center is indistinguishable from one rotated by 120, 180, 240, 300 and 360 degrees. These 6 rotation operations form a mathematical group so that adding or subtracting any two operations always result in a rotation operation that is already a member of the group ( 180 = 120 + 60 etc). The Grand Unification Theories of the electro-nuclear interaction are based on point symmetry groups named SU(3), SU(2) and U(1) which represent analogous ‘rotations’ in a more complex mathematical space. In the context of ponderable matter, point symmetry groups are also the mathematical statement of what we believe to be the structure of the fundamental particles of matter, namely, that particles are point-like having no physical size at all. But what if this isn’t so? The best that experimental physics has to offer is that the electron which is one of a family of 6 known Leptons, behaves like a point particle at scales down to 10 cm, but that’s still an enormous distance compared to the gravitational Planck scale of 10 cm where complete unification with gravity is expected to occur. By assuming that fundamental particles have internal structure, Michael Green at Queen Mary College and John Schwartz at Caltech made a remarkable series of discoveries which were anounced in the journal NATURE in April 1985. They proposed that, if a point particle were replaced by a vibrating ‘string’ moving through a 10-dimensional spacetime, many of the problems plaguing SUSY GUTs seemed to vanish miraculously. What’s more, of all the possible kinds of ‘Superstring’ theories, there were only two ( called SO(32) and E8 x E8′) that were: 1) Consistent with both the principles of relativity and quantum mechanics,2) Allowed for the asymmetry between left and right-handed processes and, 3) Were free of anomalies. Both versions were also found to have enough room in them for 496 different types of fields; enough to accomodate all of the known fundamental particles and then some! Superstring theories also have very few adjustable parameters and from them, certain quantum gravity calculations can be performed that give finite answers instead of infinite ones. In spite of their theoretical successes, Superstring theories suffer from the difficulty that the lightest Superstring particles will be completely massless while the next more massive generation will have masses of 10 GeV. It is not even clear how these supermassive string particles are related to the known particles which are virtually massless by comparison (a proton has a mass of 1 GeV!). It is also not known if the 496 different particles will cover the entire mass range between 0 and 10 GeV. It is possible that they may group themselves into two families with masses clustered around these two extreems. In the later instance, experimental physicists may literally run out of new particles to discover until accelerators powerful enough to create supermassive particles can be built. An attractive feature of the SO(32) model, which represents particles as open-ended strings, is that gravity has to be included from the start in order to make the theory internally consistent and capable of yielding finite predictions. It is also a theory that reduces to ordinary point field theories at energies below 10 GeV. The complimentary theory, E8 x E8′, is the only other superstring theory that seems to work as well as SO(32) and treats particles as though they were closed strings without bare endpoints. This model is believed to show the greatest promise for describing real physical particles. It also includes gravity, but unlike SO(32), E8 x E8′ does seem to reduce at low energy, to the symmetry groups associated with the strong, weak and electromagnetic interactions, namely, SU(3), SU(2) and U(1). If E8 x E8′ is destined to be the ‘ultimate, unified field theory’, there are some additional surprises in store for us. Each group, E8 and E8′, can be reduced mathematically to the products of the groups that represent the strong, weak and electromagnetic forces; SU(3) x SU(2) x U(1). If the E8 group corresponds to the known particles what does E8′ represent? In terms of its mathematical properties, symmetry considerations alone seem to require that the E8′ group should be a mirror image of E8. If E8 contains the groups SU(3), SU(2) and U(1) then E8′ contains SU(3)’, SU(2)’ and U(1)’. The primed fields in E8′ would have the same properties as those we ascribe to the strong, weak and electromagnetic forces. The E8′ particle fields may correspond to a completly different kind of matter, whose properties are as different from matter and anti-matter as ordinary matter is from anti-matter! ‘Shadow Matter’ as it has been called by Edward Kolb, David Seckel and Michael Turner at Fermilab, may actually co-exist with our own – possibly accounting for the missing mass necessary to close the universe. Shadow matter is only detectable by its gravitational influence and is totally invisible because the shadow world electromagnetic force (shadow light) does not interact with any of the particles in the normal world. The quest for a mathematical description of the physical world uniting the apparent differences between the known particles and forces, has led physicists to the remarkable conclusion that the universe inhabits not just the 4 dimensions of space and time, but a much larger arena whose dimensionality may be enormous (see Does Space Have More Than 3 Dimensions?). Both the Superstring theories and SUSY GUTs agree that our physical world has to have more than the 4 dimensions we are accustomed to thinking about. A remarkable feature of Superstring theory is that of all the possible dimensionalities for spacetime, only in 10-dimensions ( 9 space dimensions and 1 time dimension) will the theory lead to a computationally finite and internally consistent model for the physical world that includes the weak interaction from the outset, and where all of the troublesome anomalies cancil exactly. In such a 10-dimensional world, it is envisioned that 6 dimensions are now wrapped-up or ‘compactified’ into miniscule spheres that accompany the 4 coordinates of every point in spacetime. What would a description of the early universe look like from this new viewpoint? The 6 internal dimensions are believed to have a size of order 10 cm. As we follow the history of the universe back in time, the 3 large dimensions of space rapidly shrink until eventually they become only 10 cm in extent. This happened during the Planck Era at a time, 10 seconds after the Creation Event. The appearance of the universe under these conditions is almost unimaginable. Today as we look out at the most distant quasar, we see them at distances of billions of lightyears. During the Planck Era, the matter comprising these distant systems was only 10 cm away from the material that makes-up your own body! What was so special about this era that only 4 of the 10 dimensions were singled-out to grow to their enormous present size?. Why not 3 ( 2 space + 1 time) or 5 ( 4 space + 1 time)? Physicists have not as yet been able to develope an explanation for this fundamental mystery of our plenum, on the other hand, it may just be that had the dimensional breakdown of spacetime been other than ‘4 + 6’, the physical laws we are the products of, would have been totally inhospitable to life as we know it. As we relentlessly follow the history of the universe to even earlier times, the universe seems to enter a progressively more and more symmetric state. The universe at 10 seconds after the Big Bang may have been populated by supermassive particles with masses of 10^15 GeV or about 10^-13 grams each. These particles ultimatly decayed into the familiar quarks and leptons once the universe had grown colder as it expanded. In addition, there may only have been a single kind of ‘superforce’ acting on these particles; a force whose character contained all of the individual attributes we now associate with gravity, electromagnetism and the strong and weak nuclear forces. Since the particles carrying the ‘superforce’ had masses similar to those of the supermassive particles co-existing then, the distinction between the force-carriers and the particles they act on probably broke-down completely and the world became fully supersymmetric. To go beyond the Planck Era may require a radical alteration in our conventional way of thinking about time and space. Only glimpses of the appropriate way to think about this multidimensional landscape can be found in the equations and theories of modern-day physics. Beyond the Planck Era, all 10 dimensions (and perhaps others) become co-equal at least in terms of their physical size. 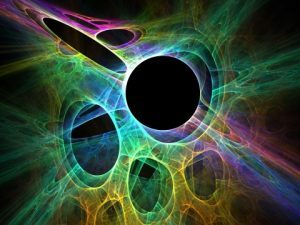 The supermassive Superstring particles begin to take-on more of the characteristics of fluctuations in the geometry of spacetime than as distinguishable, ingredients in the primordial, cosmological ‘soup’. There was no single, unique geometry for spacetime but, instead, an ever-changing quantum interplay between spacetimes with an unlimited range in geometry. 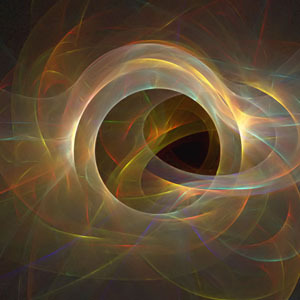 Like sound waves that combine with one another to produce interference and reinforcement, the spacetime that emerged from the Planck Era is thought to be the result of the superposition of an infin ite number of alternate spacetime geometries which, when added together, produced the spacetime that we are now a part of. Was there light? Since the majority of the photons were probably not created in large numbers until at least the beginning of the Inflationary Epoc, 10^-36 seconds after the Big Bang, it is not unthinkable that during its earliest moments, the universe was born out of darkness rather than in a blinding flash of light. All that existed in this darkness before the advent of light, was an empty space out of which our 10-dimensional spacetime would later emerge. Of course, under these conditions it is unclear just how we should continue to think about time itself. In terms of the theories available today, it may well be that the particular dimension we call Time had a definite zero point so that we can not even speak logically about what happened before time existed. The concept of ‘before’ is based on the presumption of time ordering. A traveler standing on the north pole can never move to a position on the earth that is 1 mile north of north! Nevertheless, out of ingrained habit, we speak of the time before the genesis of the universe when time didn’t exist and ask, “What happened before the Big Bang?”. The list of physicists investigating this ‘state’ has grown enormously over the last 15 years. The number of physicists, worldwide, that publish research on this topic is only slightly more than 200 out of a world population of 5 billion! This proposal by Tryon was regarded with some scepticism and even amusement by astronomers, and was not persued much further. This was a fate that had also befallen the work on 5-dimensional general relativity by Theodore Kaluza and Oskar Klein during the 1920’s which was only resurrected in the late 1970’s as a potent remedy for the ills plaguing supersymmetry theory. In 1978, R. Brout, P. Englert, E. Gunzig and P. Spindel at the University of Brussels, proposed that the fluctuation that led to the creation of our universe started out in an empty, flat, 4-dimensional spacetime. The fluctuation in space began weakly, creating perhaps a single matter- antimatter pair of supermassive particles with masses of 10^19 GeV. The existence of this ‘first pair’ stimulated the creation from the vacuum of more particle-antiparticle pairs which stimulated the production of still others and so on. Space became highly curved and exploded, disgorging all of the superparticles which later decayed into the familiar leptons, quarks and photons. Heinz Pagels and David Atkatz at Rockefeller University in 1981 proposed that the triggering agent behind the Creation Event was a tunneling phenomenon of the vacuum from a higher-energy state to a lower energy state. Unlike the Brout-Englert-Gunzig-Spindel model which started from a flat spacetime, Pagels and Atkatz took the complimentary approach that the original nothingness from which the universe emerged was a spatially closed, compact empty space, in other words, it had a geometry like the 2-D surface of a sphere. but the dimensionality of its surface was much higher than 2. Again this space contained no matter what-so-ever. The characteristics (as yet unknown) of the tunneling process determined, perhaps in a random way, how the dimensionality of spacetime would ‘crystallize’ into the 6+4 combination that represents the plenum of our universe. A perusal of the scientific literature during the last 20 years suggests that we may be rapidly approaching a major crossroad in physics. One road seems to be leading to a single unification theory that is so unique among all others that it is the only one consistent with all the major laws we know about. It is internally consistent; satisfies the principles of relativity and quantum mechanics and requires no outside information to describe the particles and forces it contains . A prototype of this may be superstring theory with its single adjustable parameter, namely, the string tension. The other road is much more bleak. It may also turn out that we will create several theoretical systems that seem to explain everything but have within them hard to detect flaws. These flaws may stand as barracades to further logical inquiry; to be uncovered only through experiments that may be beyond our technological reach. It is possible that we are seeing the beginning of this latter process even now, with the multiplicity of theories whose significant deviations only occur at energies near 10^19 GeV. I find it very hard to resist the analogy between our current situation and that of the Grecian geometers. For 2000 years the basic postulates of Eulidean geometry and the consequences of this logical system, remained fixed. It became a closed book with only a few people in the world struggling to find exceptions to it such as refutations of the parallel line postulate. Finally during the 19th century, non-euclidean geometry was discovered and a renaissance in geometry occurred. Are physicists on the verge of a similar great age, finding themselves hamstrung by not being able to devise new ways of thinking about old problems? Egyptian cosmology was based on motifs that the people of that age could see in the world around them; water, sky, land, biological reproduction. Today we still use motifs that we find in Nature in order to explain the origin of the universe; the geometry of space, virtual particles and vacuum fluctuations. We can probably expect that in the centuries to follow, our descendents will find still other motifs and from them, fashion cosmologies that will satisfy the demands of that future age with, possibly, much greater accuracy and efficiency than ours do today. Perhaps, too, in those future ages, scientists will marvel at the ingenuity of modern physicists and astronomers, and how in the space of only 300 years, we had managed to create our own quaint theory as the Egyptians had before us. In the meantime, physicists and astronomers do the best they can to fashion a cosmology that will satisfy the intellectual needs of our age. Today, as we contemplate the origin of the universe we find ourselves looking out over a dark, empty void not unlike the one that our Egyptian predecessors might have imagined. This void is a state of exquisite perfection and symmetry that seems to defy description in any linguistic terms we can imagine. Through our theories we launch mathematical voyages of exploration, and watch the void as it trembles with the quantum possibilities of universes unimaginable. So here’s the big problem. Right now, physicists have a detailed mathematical model for how the fundamental forces in nature work: electromagnetism, and the strong and weak nuclear forces. 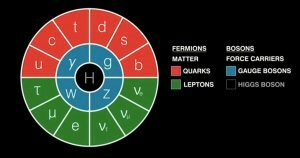 Added to this is a detailed list of the fundamental particles in nature like the electron, the quarks, photons, neutrinos and others. Called the Standard Model, it has been extensively verified and found to be an amazingly accurate way to describe nearly everything we see in the physical world. It explains why some particles have mass and others do not. It describes exactly how forces are generated by particles and transmitted across space. Experimenters at the CERN Large Hadron Collider are literally pulling out their hair to find errors or deficiencies in the Standard Model that go against the calculated predictions, but have been unable to turn up anything yet. They call this the search for New Physics. Along side this accurate model for the physical forces and particles in our universe, we have general relativity and its description of gravitational fields and spacetime. GR provides no explanation for how this field is generated by matter and energy. It also provides no description for the quantum structure of matter and forces in the Standard Model. GR and the Standard Model speak two very different languages, and describe two very different physical arenas. For decades, physicists have tried to find a way to bring these two great theories together, and the results have been promising but untestable. This description of gravitational fields that involves the same principles as the Standard Model has come to be called Quantum Gravity. The many ideas that have been proposed for Quantum Gravity are all deeply mathematical, and only touch upon our experimental world very lightly. You may have tried to read books on this subject written by the practitioners, but like me you will have become frustrated by the math and language this community has developed over the years to describe what they have discovered. The problem faced by Quantum Gravity is that gravitational fields only seem to display their quantum features at the so-called Planck Scale of 10^-33 centimeters and 10^-43 seconds. I cant write this blog using scientific notation, so I am using the shorthand that 10^3 means 1000 and 10^8 means 100 million. Similarly, 10^-3 means 0.001 and so on. Anyway, the Planck scale also corresponds to an energy of 10^19 GeV or 10 billion billion GeV, which is an energy 1000 trillion times higher than current particle accelerators can reach. There is no known technology that can reach the scales where these effects can be measured in order to test these theories. Even the concept of measurement itself breaks down! This happens because the very particles (photons) you try to use to study physics at the Planck scale carry so much energy they turn into quantum black holes and are unable to tell you what they saw or detected! One approach to QG is called Loop Quantum Gravity. Like relativity, it assumes that the gravitational field is all there is, and that space and time become grainy or ‘quantized’ near the Planck Scale. The space and time we know and can experience in-the-large is formed from individual pieces that come together in huge numbers to form the appearance of a nearly-continuous and smooth gravitational field. The problem is that you cannot visualize what is going on at this scale because it is represented in the mathematics, not by nuggets of space and time, but by more abstract mathematical objects called loops and spin networks. The artist rendition above is just that. So here, as for Feynman Diagrams, we have a mathematical picture that represents a process, but the picture is symbolic and not photographic. The biggest problem, however, is that although it is a quantum theory for gravity that works, Loop Quantum Gravity does not include any of the Standard Model particles. It represents a quantum theory for a gravitational field (a universe of space and time) with no matter in it! In other words, it describes the cake but not the frosting. The second approach is string theory. This theory assumes there is already some kind of background space and time through which another mathematical construct called a string, moves. Strings that form closed loops can vibrate, and each pattern of vibrations represents a different type of fundamental particle. To make string theory work, the strings have to exist in 10 dimensions, and most of these are wrapped up into closed balls of geometry called Calabi-Yau spaces. Each of these spaces has its own geometry within which the strings vibrate. This means there can be millions of different ‘solutions’ to the string theory equations: each a separate universe with its own specific type of Calabi-Yau subspace that leads to a specific set of fundamental particles and forces. The problem is that string theory violates general relativity by requiring a background space! In other words, it describes the frosting but not the cake! One solution proposed by physicist Lee Smolin is that Loop Quantum Gravity is the foundation for creating the strings in string theory. If you looked at one of these strings at high magnification, its macaroni-like surface would turn into a bunch of loops knitted together, perhaps like a Medieval chainmail suit of armor. The problem is that Loop Quantum Gravity does not require a gravitational field with more than four dimensions ( 3 of space and one of time) while strings require ten or even eleven. Something is still not right, and right now, no one really knows how to fix this. Lacking actual hard data, we don’t even know if either of these theories is closer to reality! What this hybrid solution tries to do is find aspects of the cake that can be re-interpreted as particles in the frosting! This work is still going on, but there are a few things that have been learned along the way about the nature of space itself. At our scale, it looks like a continuous gravitational field criss-crossed by the worldlines of atoms, stars and galaxies. This is how it looks even at the atomic scale, because now you get to add-in the worldlines of innumerable ‘virtual particles’ that make up the various forces in the Standard Model. But as we zoom down to the Planck Scale, space and spacetime stop being smooth like a piece of paper, and start to break up into something else, which we think reveals the grainy nature of gravity as a field composed of innumerable gravitons buzzing about. But what these fragmentary elements of space and time ‘look’ like is impossible to say. All we have are mathematical tools to describe them, and like our attempts at describing the electron, they lead to a world of pure abstraction that cannot be directly observed. 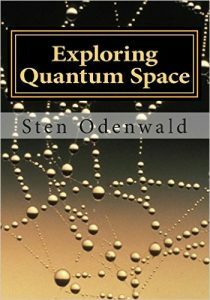 If you want to learn a bit more about the nature of space, consider reading my short booklet ‘Exploring Quantum Space‘ available at amazon.com. It describes the amazing history of our learning about space from ancient Greek ‘common sense’ ideas, to the highlights of mind-numbing modern quantum theory. Check back here on Thursday, December 22 for the last blog in this series!